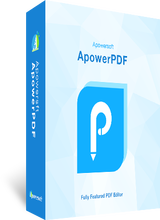 ApowerPDF is a powerful PDF program which can help you convert, view and edit PDF files. It contains many useful features, including creating PDF, adding texts and images, merging PDFs, inserting watermarks and links, protecting and unlocking PDF documents, signing, annotating, extracting pages, rotating and more. You can use it to modify your PDF with ease. Key Features: • Create PDF from blank PDF or from other formats. • Edit PDF and add text, images, rectangle links to PDF. • Add headers and footers, watermarks, signature and bate numbers to a PDF document. • Remove watermarks and change PDF background color. • Reduce PDF file size directly or using PDF Optimizer • Insert a blank page or another PDF file to the current PDF you are editing. • Delete, crop, replace PDF pages. • Split PDF document. • Protect and unlock PDF file. • Combine multiple PDF documents into one. • View PDF files, and add bookmarks, annotation and comments to the file you are reading. • Convert PDF files. Three Steps to Edit Your PDF: 1. Open a PDF document with the program. 2. Go to the “Edit”, “Sign” or “Comment” tab to modify the content of the file. And you can also click “Pages” to manage the pages of a PDF. 3. Go to “File” > “Save” or “Sava As” to keep the changes.